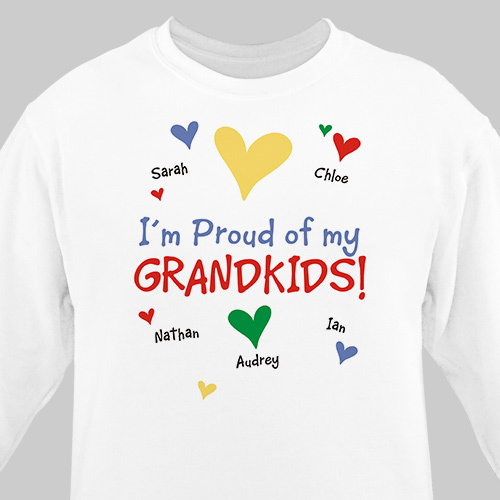 Family pride comes from your kids and grandkids now you can show them all off with one of these delightful personalized sweatshirts just for grandparents and parents. Grandparents customizable sweatshirts are available on our premium cotton/poly blend sweatshirt, machine washable in adult sizes S-3XL, please choose white, pink or ash gray. Free personalization includes any title like Grandkids, Kids, Great Grandkids and up to 30 children or grandchildren’s names. A rainbow of colored hearts are printed throughout all the kids names. Sizing and quality are very good! Printing also well done. Looks great! Gift for my sister. Hope she likes it. Additional Details Our personalized grandparents shirts make excellent Mother's Day Gifts and Grandparent's Day Gifts! These grandparents shirts make unique gift ideas from the kids.